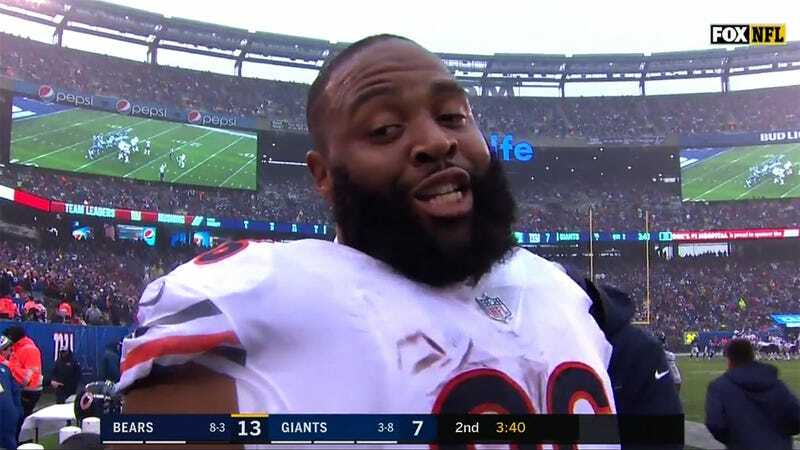 Clemson showed its ability to pay homage to notable alumnus, William “The Fridge” Perry, by scoring fat guy touchdowns left and right, and now the Chicago Bears are getting in on the fun. The Bears were in an obvious running formation on 4th-and-goal from the one-yard line late in the first half. When Chase Daniels snapped the ball, he turned to his left and handed it off to the 332-pound defensive tackle, Akiem Hicks. While the near-exact imitation is exciting in its own right, the best part of the play came from the FOX crew who said they asked Hicks during a production meeting if he’d be a goal-line running back option. Hicks apparently lied and said no.